Find items for Delvin Mallory throughout the questline. 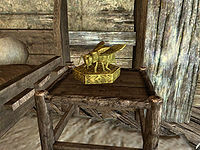 Find the Queen Bee Statue in Goldenglow Estate and bring it to Delvin Mallory. Find the Honningbrew Decanter in Honningbrew Meadery. Find the East Empire Shipping Map in the East Empire Company Warehouse in Solitude. Find the Model Ship in Snow Veil Sanctum. Find the Dwemer Puzzle Cube in Calcelmo's Laboratory within Understone Keep in Markarth. Find the Bust of the Gray Fox in Riftweald Manor in Riften. Find the Left Eye of the Falmer in the Dwemer ruin, Irkngthand. During the course of the Thieves Guild questline, you may run into one of several unique items in locations relevant to the quests. Picking them up will add a miscellaneous task to take it to Delvin Mallory, who will pay a leveled amount of money for the item. The first trinket that you will likely encounter is the Queen Bee Statue. It is found in the Goldenglow Estate, on a table in Aringoth's room. This location is visited in the Thieves Guild quest Loud and Clear. When picked up, a prompt will tell you to return the item to Delvin Mallory. The Honningbrew Decanter is located in a room in the upper floor of the Honningbrew Meadery, behind the door which has an expert lock. You will most likely come across it during the quest Dampened Spirits. The East Empire Shipping Map can be found on a table next to some loot in the Dockmaster's office in the East Empire Company Warehouse. It is easiest to acquire this during the quest Scoundrel's Folly; if you attempt to steal it at any other point, the warehouse may be patrolled by guards, who will attack you on sight if spotted. The Model Ship is found on a booby-trapped pedestal in Snow Veil Catacombs. The pedestal is surrounded by oil, and removal of the ship causes the oil to burst into flame. It is fairly easy to grab the ship near the doorway and retreat to avoid the fire. It is also possible to shoot one of the exploding urns that fall to set off the trap; however, this causes the ship to fly away from the resulting explosion—into a wall, behind a cabinet or even into the room below—making it easy to lose. Another option is to shoot the ship away from the oil on the ground. Be aware that picking up the ship will still trigger the urns. Another option, if you know the Telekinesis spell, is to stand away from the oil and use the spell to retrieve the ship. Another option is to place an item on the pedestal, preventing the trap from activating when you take the ship. The last option would be to use the "Slow Time" shout. Go right up to the pedestal, shout, immediately grab the ship and run away from the oil. Even if you only have the first word of the shout, you will have plenty of time to watch the urns fall to the ground. Of course, you can always set the oil on fire yourself and let it burn up, then take the ship, but the urns will still injure you a bit if you stand too close. Use any flame spell (besides cloak) or the "Fire Breath" shout. You can also use whirlwind sprint, grab the ship, and immediately sprint away from the oil. You visit Snow Veil Catacombs during the quest Speaking with Silence. 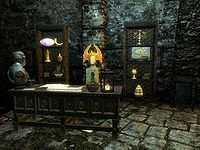 The Dwemer Puzzle Cube is in Calcelmo's Laboratory, which is accessed via the Dwemer Museum in Understone Keep. It is found in the large room with the Arcane Enchanter, just before moving on to the balcony. You travel through the laboratory during the quest Hard Answers. The Bust of the Gray Fox is found on a table in Riftweald Manor during the quest The Pursuit. It is easy to miss, as it blends perfectly with the stone behind it, but it's sitting right next to the quest objective. The Left Eye of the Falmer can be taken from Mercer Frey's corpse in the Irkngthand Sanctuary during the quest Blindsighted. After you turn in the Left Eye of the Falmer to Delvin, you can steal it back from its shelf in the Cistern within the Ragged Flagon, and sell it again to Tonilia to double your profit. This is the amount of gold you get each time you turn in an item. The total amount of gold you can accumulate ranges from 350 to 5,600 gold. It does not matter what order you pick up the items, after picking up the final item the quest will be marked as complete and you will be no longer able to turn any of the items still in your inventory to Delvin Mallory. Sometimes you cannot sell the Left Eye of the Falmer to Delvin. Select the Eye through the console by entering PRID 000e8efe . Type Enable in the console. The item should now be visible on the shelf. Type Player.RemoveItem 0001994f 1 to remove the Eye from your inventory if you cannot otherwise do so. The quest Hard Answers sometimes triggers when retrieving the Dwemer Puzzle Cube after it has already been completed. ? Using the console enter SetStage TG06 200 . The quest will now move to the completed section of your quest journal. If desired, the duplicate Nightingale Blade may be removed by entering Player.RemoveItem 000f6527 1 via the console. Sometimes the East Empire Shipping Map will not appear in the East Empire Company Warehouse, even after the associated quest is completed. ? Items that were once on the shelves are now missing or somewhere else in the room. Select the item(s) through the console by entering PRID X where X corresponds to the ID referencing the item in question (see list below). Type RecycleActor in the console. Repeat as necessary. 20 I've discovered an unusual statue of a queen bee within Goldenglow Estate. I should take it to Delvin Mallory at the Ragged Flagon to determine its true value. 30 I've discovered an unusual golden decanter inside Honningbrew Meadery. I should take it to Delvin Mallory at the Ragged Flagon to determine its true value. 40 I've discovered what appears to be a shipping map for the East Empire Company. I should take it to Delvin Mallory at the Ragged Flagon to determine its true value. 50 I've discovered the intricately crafted model of a sailing ship inside Snow Veil Sanctum. I should take it to Delvin Mallory at the Ragged Flagon to determine its true value. 60 I've discovered an curious Dwemer-constructed puzzle cube inside Calcelmo's Quarters in Markarth. I should take it to Delvin Mallory at the Ragged Flagon to determine its true value. 70 I've discovered the bust of a man named the Gray Fox inside Mercer Frey's House. I should take it to Delvin Mallory at the Ragged Flagon to determine its true value. 80 I've recovered one of the Eyes of the Falmer from Irkngthand. I should take it to Delvin Mallory at the Ragged Flagon to determine its true value. The following empty quest stages were omitted from the table: 0, 10, 25, 35, 45, 55, 65, 75, 85, 200. On the PC, it is possible to use the console to advance through the quest by entering setstage TGLarceny stage, where stage is the number of the stage you wish to complete. It is not possible to un-complete (i.e. go back) quest stages, but it is possible to clear all stages of the quest using resetquest TGLarceny.